Join Dr. Alberto Villoldo on a shamanic journey to explore the wisdom we will need in order to thrive during these times of great change. The Return of the Magicians is an annual gathering to read the Prophecy of the Time to Come, where the shamans take the pulse of our planet and the changes that are causing upheaval in the world. During our Peru expedition you will have daily contact and instruction from Alberto and the shamans who have worked with us for decades. Due to our lengthy relationship with these medicine people, they will share with us insights and lessons they do not disclose with outsiders. In his webinar, The Return of the Magicians, Dr. Alberto Villoldo discusses the importance of coming together in community and how you can become part of the revolution of consciousness. Visit temples and archeological sites, some known to very few people. Take part in ceremonies led by master shamans at ancient places of power. Learn and master each of the Four Insights of the Medicine Way. Receive rites of initiation that will help you become an Earthkeeper. Watch Dr. Alberto Villoldo talk about our expeditions. part of the revolution in consciousness. $5,650 for single occupancy – SOLD OUT – Wait list only. Your day trip begins with a scenic train ride along the Urubamba River to Machu Picchu (7,875-ft. elevation), where guides will walk you through the fabled “City of Light.” When the guided walk concludes you can continue to explore the sanctuary at your own pace. Afterwards, you may visit the local craft markets in Aguas Calientes, before our afternoon return to our hotel. The last day to register for this optional day trip is July 2, 2019. *Excursion day takes place during the expedition. **Third party provider, all payments and arrangements are managed by WELSAT. Marcela Lobos M.A., has been initiated in the healing traditions of the Amazon and the Andes. She was born and raised in Chile where she worked with shamans that belong to a matriarchal society that holds the wisdom of the feminine and the passion of Mother Earth. 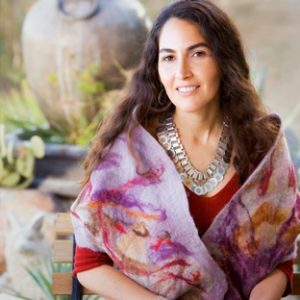 Marcela is dedicated to helping women by crafting “rites of passage” that allow them to find their power, grace, and wisdom.